This book is unlike anything I’ve ever read. Written in the first-person plural, narrated by ‘the dads’, it explores the father/son relationship in a way that’s fresh and honest, and which swings from tragedy to comedy so often it’s hard to keep up. 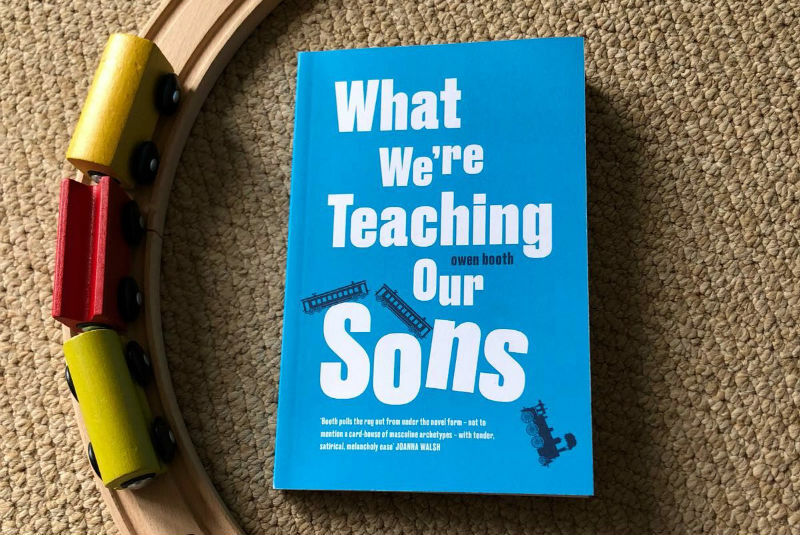 It’s delivered in very short chapters, each one titled with a topic the sons are being taught about, which are as wide-ranging as the Big Bang, relativity, the pointlessness of guilt and whales. There are no named characters, here. No forward-moving plot. And yet, its warmth and the way it encompasses the trivial mixed in with the absolutely vital keeps you turning those pages. I read it in a day, and I imagine I’ll read it many times. I’ll read sections that resonate aloud to people. I’ll read the whole thing quietly, to myself, as a reminder. Booth has perfectly captured that feeling we all have, of not being sure we’re quite ready to grow up and parent, despite already having children. He captures it in lines like ‘We look at our sons, half in fear, wondering what we have made’. Lines I wasn’t sure whether to laugh or cry at. With this, his first book, Booth has done something remarkable. He has shone a light on the way fathers and sons interact with one another, showing how beautiful and flawed and complicated that relationship can be. It’s the kind of book I will press into the hands of people, batting away their questions, saying ‘just read it’. I imagine there will be several bought, lent and lost copies of this book in my future. When he’s old enough, I will give it to my son. And the thought of what else Booth might write in the meantime is genuinely thrilling. Every night we’ll all get to play with the doll and kiss her and tell her secrets. And she’ll just look at us and listen to us, because she loves us, and we love her, too. This book will evoke memories of childhood and not always nice ones. I did bad things to my dolls, too. Scalped the Tiny Tears. Skewered them open with fountain pen nibs and scissor blades. The pop of a plastic arm pulled hard brought me latent gratification. My best friend used to mock my flat chest but said at least my messy hair distracted from it. Such are the twisted games girls play, complex manipulations which simultaneously exclude and include and always driven by white flashes of malevolence. I remember the adolescent version of myself and she still makes me uneasy. 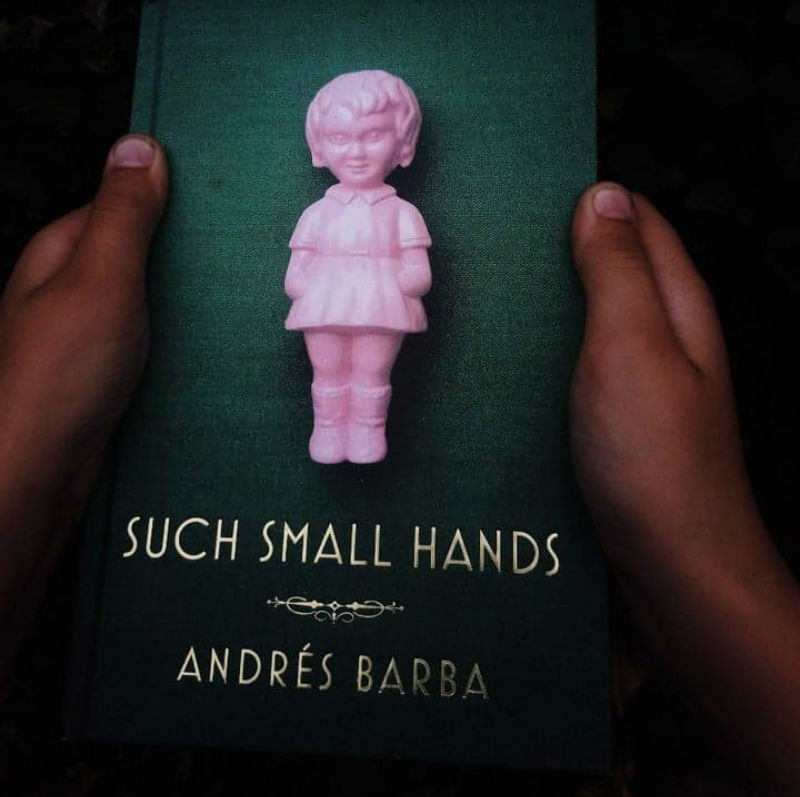 Small Hands exposes well-buried childhood cruelties and much sicker with searing accuracy. I was captivated by this book from the very beginning. It starts with a group of four siblings who visit a psychic during their childhood. The psychic tells each child the date that they will die, and the two brothers and two sisters spend the rest of their lives gripped, in some way, by the date they have been given. The rest of the novel follows each sibling into adulthood, documenting their highs and lows as they make various choices with significant consequences. There were plenty of hints about whether the psychic’s prediction would come true and I was never quite sure whether the dates of death would be accurate. 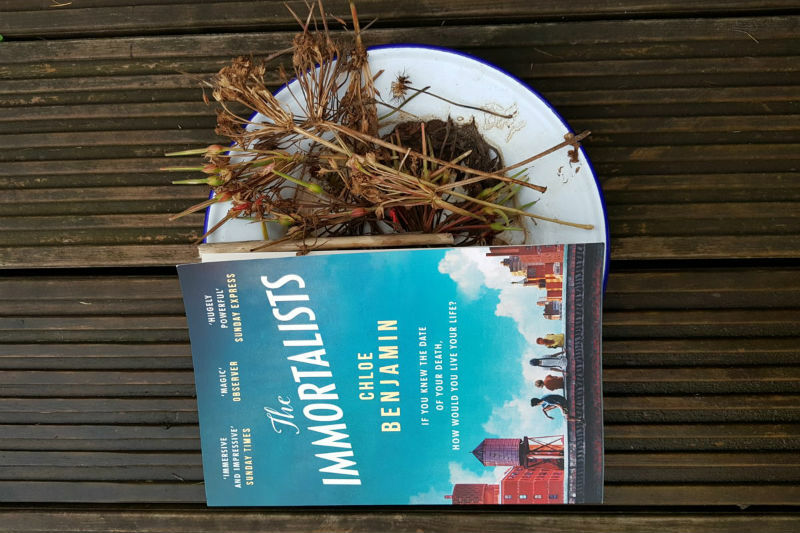 There were plenty of twists throughout, and I was left with some big questions about the way I see life and death. Would knowing the date of my death change the way I lived my life, and would that change be positive or negative? Would I believe the prediction and behave recklessly as a result, seizing every moment, or would I live carefully and try to cheat my fate? Each character was so well developed and believable, I felt I knew each member of the family personally. One of the book’s greatest strengths is in the way Benjamin describes relationships between the siblings, their partners, and their mother. Their visit to the psychic, which started as a bit of childhood fun, ends in devastating consequences for every one of them. There were so many overlapping strands that I would happily read it again to see which clever sub-plots I might have missed the first time round. This book is a brilliant example of story-telling at its best. Laura is a writer who lives in Leicestershire with her husband and their two children. When she’s not writing or reading, she can usually be found trying to get her son to put his shoes on, encouraging her daughter to sleep past 5am or moving small items from one room to another. You can follow her on Twitter and on her blog about getting cancer when she was pregnant.